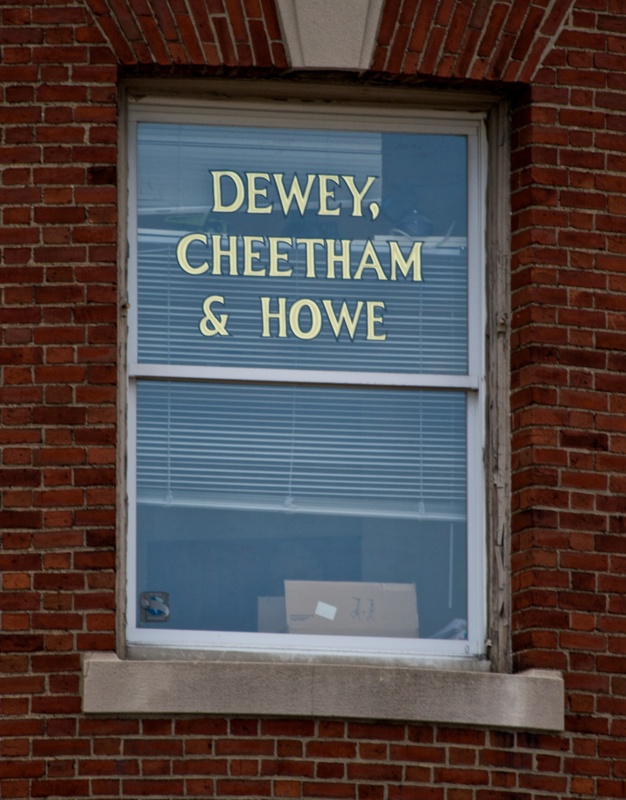 Never afraid of taking a joke too far, Tom and Ray Magliozzi named their radio production company Dewey, Cheetham & Howe. This is the window from their office in Cambridge, Massachusetts. We lost a great Troubleshooter yesterday when Tom Magliozzi, co-host of the venerable Car Talk radio program, died of “complications to Alzheimer’s disease.” If ever there was a shoo-in for the Troubleshooting Hall Of Fame, the “Tappet Brothers” would be on the top of the list. As one-half of the famous and funny pair of sibling problem-solvers, Tom was an inspiration to me and my work. The Magliozzi brother’s venerable show went off the air in 2012, after more than 30 years of belly laughs and problems bested. If you have never heard of the program and read this blog, you must take a listen. Soon. It’s mandatory. Growing up, I vividly remember their show, awed by their ability to diagnose problems on the spot. Tom and Ray were really funny too, never taking themselves, or the people who called into the show, too seriously. I have always been amazed at the ability of Tom and Ray to diagnose a problem remotely and verbally, just by asking the right questions. If you’ve ever done phone-based tech support, you know how difficult it can be to separate the wheat from the chaff, extracting those few meaningful bits of information that will lead you in the right direction. Tom’s detective skills were combined with deep knowledge of how things work, with cars specifically and the world in general. In addition to working as a mechanic, solving people’s real-world problems, he also had a wide-ranging education: a bachelor’s degree in Chemical Engineering from MIT, an MBA from Northeastern University, and a PhD in marketing from Boston University. Now that’s a diverse background! Of course, what made the show appealing to a broader audience was the interplay between a caller’s personal life and what was going on with their vehicle. In parallel to the investigation of someone’s car troubles, the Magliozzi brothers also uncovered personal details as fodder for their sharp wit, reminding you that human and machine problems are deeply interconnected. Are they really discussing this guy’s broken camshaft, or his wounded ego in the aftermath of his girlfriend dumping him? Tom’s exuberant sense of life implicitly communicated that the most effective way to face our problems is the same in either realm. This is the reason why the show appealed to both grease monkeys and those who rarely lift a wrench. When I published my book, I sent Tom a copy. Even if he used it for a doorstop or kindling, I just had to get it in his hands. In fact, I would have been flattered if he made fun of it, because it was a gift to a man who made me laugh, inspiring me and Troubleshooters everywhere. I am having trouble downloading your e-book – a project I will have to do next time I am in town, where I can access faster Internet. While waiting for my connection to try the impossible I read your blog on Tom Magliozzi. He sounded so great I tried to download one of his shows, but, same problem, slow Internet. May I suggest two projects for you? One: develop an equivalent of You Tube Downloader that can just plug away at these larger files, picking up where it left off on a previous session until the file is downloaded in it’s entirety. Two: Persuade Car Talk to put all of Tom and Ray’s show onto a single file which we can purchase in bulk. From where I am, paying 90c for each show is a hurdle even before I start to try to download the audio file. I could then buy the complete set on a memory stick (I think you call them thumb drives) with the Car Talk logo all over it. As far as Car Talk is concerned, it looks like you can listen to select episodes for free via the Car Talk podcast in iTunes. Likewise, a featured show is usually available to listen for free on the front page of CarTalk.com (although streaming may not work if you have really bad Internet connection). Your latest Blog (about a new version of the Trouble Shooting Guide) came in as I was reading your book – about talking to a duck. Brilliant, and I know times when explaining a problem to someone else helped the light bulb come on. I ought to write one of them up for you sometime. But what I wanted to comment on was your Try one thing at a Time strategy and the need to change it BACK to how it was, BEFORE trying the next. THE classic example of this is when you have six unknown wires coming out of a 3 phase induction motor. Identifying which goes with which pair is straightforward, but there is no way of knowing which end of a pair is the 1 and which is the 2. You have to resort to trial and error. If your trial is wrong (and the motor runs “rough”) you have to try swapping one coil. It may still run rough, and it is important to know that, before trying the next coil, you MUST revert the first one to it’s original connection. Otherwise you will literally be chasing your tail!